Quick summary of the project: we're two Debian developers who want towill translate our French Debian best-seller and possibly publish it under a free license. The latter will only happen if the liberation fund reaches 25 K€. In October 2004, I had been working on my first book for over a year. I have to admit that I was extremely conscientious in the drafting of the book since it deals with Debian GNU/Linux and that I have devoted a large part of my personal and professional life to it since 1998. On 14th October 2004, several important websites in the French-speaking free software community (in particular LinuxFr.org) announced that the book was available. The information spread quickly, we could feel that the book addressed a clear gap in the existing literature and that it generated a lot of interest. It was even the most sold book on Amazon.fr for an entire morning. Its success was such that the first edition was completely sold out barely four months after its first publication. I therefore prepared a second edition straight away and added a few sections as suggested by the first readers of the book. Indeed I rapidly began receiving the comments of my first readers. Beginners generally found the book particularly valuable to gain in confidence and install a distribution that they had found intimidating until then. The first chapter clearly demystifies the Debian project by explaining how the distribution is developed. The remaining chapters are articulated around a case study that serve as a red thread, and start with how to install Debian. A whole chapter details all the steps of the installation process. Étienne Liétart: This book has allowed me, as an amateur of IT, to approach things with more serenity. For a non specialist, that is important. Of course the book isn’t entirely exhaustive on Debian, but it contains a lot of information. And it is above all didactic and easy to follow. The book also encourages readers to practice. Even a real administrator (not an amateur like me) will be able to benefit from the experience of the author. People can sometimes read on the Internet that “Debian is made for professionals, is not accessible…”. This book can function as a springboard for amateurs. I learnt to install Postfix, amavisd-new, clamav, dovecot on my old laptop thanks to this book… Then in December 2010 I installed Debian Lenny with an IMAP server on a second-hand machine that we use in a small non-profit organization. IT administrators from various backgrounds can rapidly learn basic elements to feel comfortable using Debian GNU/Linux, starting with the way the package management works: two chapters deal respectively with dpkg and the APT tools. The following two chapters describe all of the elements that constitute a Unix and especially a Debian system: network, user management, access rights, kernel and bootloader, startup, remote login, log management, task scheduling, etc. Network administrators can learn among other things how to use Debian as a firewall gateway, how to install a virtual private network as well as setting up DNS and DHCP servers. The major network services are the main theme of a whole chapter: the Apache web server, the Postfix mail server, FTP/NFS/Samba file servers, the OpenLDAP directory, etc. 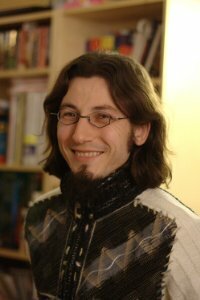 Christian Perrier: As the manager of part of the computer infrastructure of Onera, I have always found the “Debian Handbook” particularly useful to get the new administrators of the servers that I put in place started. Explaining the specificities of installing and administering a Debian server is often difficult to achieve but the book does this wonderfully and makes my work much easier. This explains why the book occupies a good spot on the shelves of the technical library of the Onera IT team… as well as a spot on the shelf of my own son who has now become a convinced Debian user for his own computers. One new chapter dealt with computer security, including a new section on SELinux, and details on how to manage a computer intrusion. Questions of large scale automatic deployment were addressed in sections dealing with Fully Automatic Installer and debian-installer preseeding. A new chapter entitled “Advanced Administration” explained how to use software RAID and LVM (Logical Volume Manager), and how to manage the unavoidable breakdown of hard disks. The same chapter also dealt with virtualization: Xen first since the third edition, but KVM and LXC have also been addressed since the updates made for Debian 6.0. Throughout the book we were careful to document the specificities of Debian. Although one can find the same software from one distribution to another, a generic work on Linux cannot convey the added value that the Debian infrastructure can bring you. As Debian developers we know these specificities well and have tested them – for ourselves as well as for numerous customers. 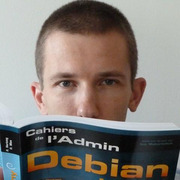 David Bercot : I discovered the Debian Handbook when I started switching over to free software. […] I needed a guide that could both give a broad overview of the system, and delve into technical details. The first chapter on the Debian project and its specific nature within the Linux ecosystem allowed me to understand why this distribution was really unique and why it was so popular with millions of users. That’s it for the presentation of the French version of the Debian Handbook. We are now in 2011, almost 7 years after its first publication, and we would now like to add a new chapter to the story – that of its translation into English and of its release under a free license so that everybody may benefit from it. Despite its success, no English-speaking editor that we contacted was willing to take the risk of translating and publishing the book. Not put off by a setback, we decided to negotiate with our French editor Eyrolles to recuperate the necessary rights to translate the book into English. And today we call upon your support to bring this project to fruition. Translating a book of 450 pages well is a considerable effort that requires several months of work. For self-employed people like us, we need to ensure a minimum income to mobilize the time necessary to complete the project. The official objective that we set on Ulule.com corresponds to a very low payment for the authors and translators. But we prefer to see the project come to fruition without any profit than not complete it at all. We would really like to see the book integrated into Debian, and therefore to see it published under a license that complies with the “Debian Free Software Guidelines”. But like everybody, we need to live and feed our family, and we believe that we are entitled to have a decent payment for the work that we do. With this project, our aim is to prove that it is possible to earn money even with a work that is published under a free license. The compromise that we propose is: in parallel to the funding objective that we defined on Ulule.com, we will set up a “liberation fund”. If this fund reaches 25,000 euros, the English version of the book will be distributed under a free license (GPL2+ / CC-BY-SA-3.0). choose “I do not want any reward”, your whole donation is affected to the liberation fund. Stefano Zacchiroli (Debian Project Leader): Debian has long resolved that books, as well as other documentation material, should be kept at the same high freedom standard we require for software. The scarce availability of free (as in Freedom) books about Debian is hence doubly unfortunate. It means that there is little book-like material that helps spreading Debian and its values, while at the same time embodying those values showing off their advantages. But it also means, ironically, that we have little such material that we can distribute as part of Debian itself. I welcome any initiative that might help closing this gap. I also encourage authors of books on the topic of Debian to release their work under a license compatible with the Debian Free Software Guidelines. If the total amount of the donations were to largely exceed our objectives (which we hope! ), the extra money will be used by the authors to spend extra time improving Debian. We are both self-employed and independent developers and have the freedom to devote as much time as we wish to Debian and free software as long as we have enough money to live. Contribute even if the objectives are achieved: the money will not be lost, but will rather constitute another contribution to Debian after the liberation of a Debian book! To thank you for your support, we give you the possibility of choosing between several rewards. As an advocate of the Free Software cause, I want to emphasize that the best reward for a book is its liberation since it will allow everyone (including those who did not take part in the operation) to benefit from the electronic version of the book. The money will be best used through this type of reward since any “physical” reward has a cost that will be deducted from what you donate. Now, I have always enjoyed handling paper copies of books and we have planned to release a paperback version for those who would like a copy (and who will have supported the project with a donation of 45 euros or more). French speakers can also choose to be rewarded with the French version of the book (published by Eyrolles), which will allow you to support the project even if you are not directly interested in the English translation. You may only choose this reward if you live in metropolitan France (shipping rates are too expensive for other destinations). You should above all choose the reward that you like, but give more than the requested amount in order to contribute to the liberation fund — allowing all to benefit from this book. Gilles Roussi: I was already working with Linux and Debian but this work really helped me to become more independent. In other words, this book, thanks to its relevance, has allowed me to stand on my own two feet and has above all helped most of my students to understand the distribution better. 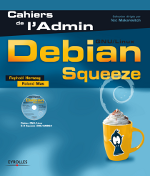 Olivier Delemar: I have administrated Linux (and particularly Debian) servers and stations for years, and I wanted a reference work that would explain – or confirm – what the “Debian way” is. In this light, I am more than happy with my purchase. As a bedside book, your book is totally inappropriate: it is impossible to fall asleep whilst reading it because it is so relevant and pleasant to read. As a reference book, I am very far from putting it on a shelf in my library, it will follow me everywhere. I thank you for opening my eyes and am happy to be part of the family of Linux users. For new Debian users: persevere and you will not be disappointed. The money collected will enable us to translate our book into English. If we largely exceed our goals, we might be able to hire a professional translator to help us. Otherwise we will complete the entire translation ourselves. The money willsupport Roland and me during the 3months required to completethe translation(an estimated total of6 man-monthsof work). Indeed, as we are both freelancers, all the timespent on the translationresults directly in a loss of revenue since we're no longer taking care of our customers. After this, if there is money left, it will be used to spend more time contributing to Debian and free software in general. I have a long list of Debian projects that I would like to do and that are only waiting for me to find the time required, and the same goes for Roland, in particular for the FusionForge software that he is maintaining (and that Debian is using on alioth.debian.org). 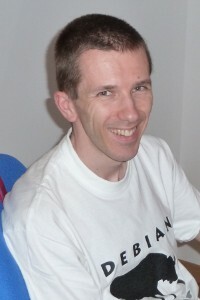 Roland and I are both long-time Debian developers: since 1997 for me (Raphaël), and since 2000 for Roland. Even though we were both hanging around in the #debian-devel(-fr) IRC channel, we first worked together while setting up alioth.debian.org. While getting to know him better, I encouraged him to work with me on this book and I never regretted this choice. We enjoyed working on the book: we love to bring new people to Debian, and this was an excellent opportunity to reach a wide public. At the same time, the book brought significant credibility to our consulting businesses. The same reasons motivate us to start this translation project. Furthermore, I would like to work full time on Debian, and I put high hopes in this book to contribute significantly to the funding for my work. This reward does not contribute to the liberation fund unless you give more than the required amount. The ebook and the great feeling of having participated to the liberation of the book. This reward contributes 5 EUR to the liberation fund (or more if you give more than 10 EUR). The ebook and a DVD of Debian 6.0 "Squeeze". The ebook and all further editions in the next 5 years. The ebook, all further editions in the next 5 years and the great feeling of having participated to the liberation of the book. This reward contributes 10 EUR to the liberation fund (or more if you give more than 30 EUR). The ebook and you're thanked nominally in the book because you contributed 35 EUR (or more) to the liberation fund. This reward contributes 35 EUR to the liberation fund (or more if you give more than 40 EUR). The book in paperback and the ebook. The original paperback published by Eyrolles in French (“Cahier de l'Admin Debian Squeeze”) and the great feeling of having participated to the liberation of the translated book. This reward will only be shipped to France, you must not select it if you live somewhere else. This reward contributes 10 EUR to the liberation fund (or more if you give more than 50 EUR). The prospective Debian contributor pack: 1 hour of mentoring with Raphaël Hertzog to help you get started as a Debian contributor, you're thanked nominally in the book, and the great feeling of having participated to the liberation of the book. The mentoring can happen either by email or on IRC. Raphaël will do his best to answer all your questions. If you're into packaging, he can also review your Debian packages (and maybe sponsor them into Debian if they're good). This reward contributes 35 EUR to the liberation fund (or more if you give more than 60 EUR). The book in paperback, the ebook and all further editions of the ebook in the next 5 years. The book in paperback, the ebook, all further editions of the ebook in the next 5 years, you're thanked nominally in the book, and the great feeling of having participated to the liberation of the book. This reward contributes 35 EUR to the liberation fund (or more if you give more than 100 EUR). The book in paperback, the ebook, all further editions of the ebook in the next 5 years, you're thanked nominally in the book, and you're invited for dinner with one (or both) of the authors during a free software conference that they are attending (DebConf preferrably, but Fosdem, Solutions Linux, and others European conferences might be possible). Travel costs are not included. This reward contributes 350 EUR to the liberation fund (or more if you give more than 500 EUR).